It's Not Work, It's Gardening! : searching for info, finding me! searching for info, finding me! After over a year of blogging about my garden and experiences related to gardening, I've seen the source of my traffic shift. Initially my few visitors either knew my site and came here directly (friends and family), or they came from other sites, mainly the bamboo forums I frequently post on. Over time I've seen more and more traffic coming from Google searches though, and those searches are now the main source of traffic to this blog. This is quite interesting to me, as I wondered what people would be searching for that would land them on INWIG. Luckily Blogger's dashboard shows me the Google search terms that directed people to my site, and reading over those searches can be quite informative and very entertaining. Today I'm going to do something a little different and take a look at these searches. I've been collecting them for a couple of months, and there are some befuddling ones in there. "watering succulents in a terrarium"
These are straightforward searches that directly relate to things I've posted about before. Patio cracks, planting in a bottomless pot, my terrarium make-over with succulents -- all things I've posted about and Google pointed people to me. "my homerun roses are starting to leaf out. can i trim them..."
"is it time to put down pre-emergent-st louis"
These make sense too. I've written about building a planter box for bamboo, my homerun roses and asked about when I can prune them. I've talked about using corn gluten as a pre-emergent and I live in suburban St. Louis. 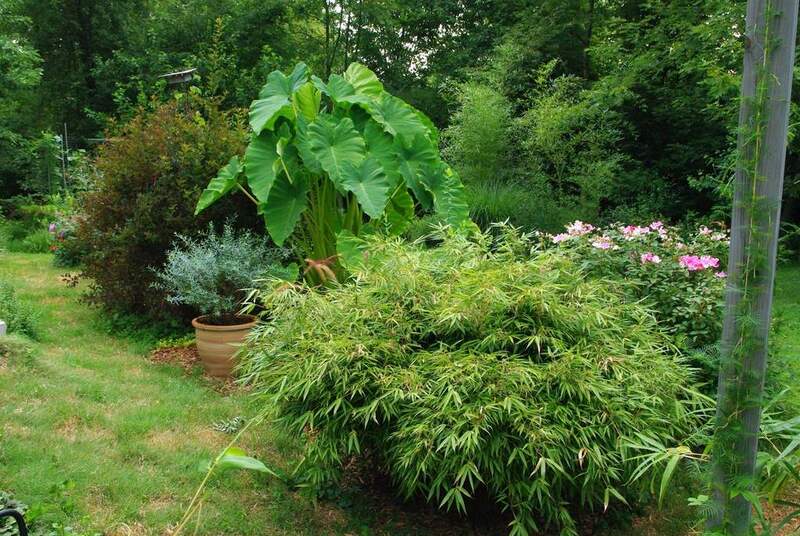 I have several Fargesia 'rufa' bamboos, and one of them top-killed last winter. The people searching for these terms probably found at least some smidgen of useful information on INWIG, at least I hope they did. "keep cats out of planter box"
"will fake bamboo harm my kitten"
Although I can see why they may have come to my site, I'm not sure that they would have found anything helpful. I've posted about Agastache, and how one species of it (Agastache rupestris) has leaves that smell to me like rootbeer -- not useful information for this searcher. I've written about cats and planter boxes separately, but not together, and not how to keep them away from each other. Same with bamboo and kittens -- lots of posts about each, but no advice on the safety of that particular kitten -- I hope the searcher found some useful information and their kitten is unharmed. "i love gardening and working in my yard"
"my lawn looks really bad its march"
"i am feeling little sluggish"
These aren't really search terms, they're more like IMs, or text messages. Maybe these people just typed into the wrong window by accident? You don't like indocalamus tessellatus (a species of bamboo)? You do know that Google is going to show you lots of photos of that exact plant you just said you don't like, right? I should note that it's a bit of a bummer that somebody Googled "my lawn looks really bad" and they got to a website that shows my garden. You don't really want to be high in the search results for that. Same goes for these similar searches: "my plants are all dying", "I am a terrible gardener", or "my garden is sh--!" (I just made those up, they're not results reported by Blogger, and I'm afraid to search to see if INWIG shows up near the top of the results for them). I like the "feeling little sluggish" one though, as it's almost the exact title of a post I wrote about -- you guessed it -- a slug. I don't know what this person or any of the others in this section were expecting to find, but I'm pretty sure they did not find it here. "finches keep pooping in nests"
"horticulture perinnial mouse ear jews?" What? The great thing about Google is you can type any crazy thing in and get something back. I'm not sure what this is. Gardening "stakes" maybe? Gardening "stinks"? I needa nap. And an aspirin -- these searches are making my head hurt. I was with you on "bamboo shoot" but you lost me with the addition of "stairs". I imagine this person had their gardening grandmother tel them (in a thick accent): "yooo need zum grrroundgover plahntz here" and went straight to Google. I ask this pretty much every day. "easy gardening for cutting grass without mass"
It turns out that this is easier than thought, as it takes no energy at all. "lifting 94 pound cement bag"
Next Google search this person did: "chiropractors open on weekends"
"bannana peels and eggshells what else"
I have no idea what this is about, but I Googled it myself and INWIG is #4 on the search results for it! I should point out that for some search terms reported by Blogger, a link to INWIG is on something like the 15th page of results. If you're clicking links on the 15th page of results, you really need to refine your search terms I think. I don't know about you, but if what I'm looking for isn't on the first three pages, I'm not going to find it. You really don't get it, and you've definitely come to the wrong place. Reviewing these search terms is entertaining and informative, and I'm definitely going to keep doing it. And remember, when you Google "kitten bamboo mushroom finch spider" and end up at INWIG, I'll know it -- I'll be watching. I should have added that knowing that people are getting here looking for information puts a little pressure on me. Sure I can post stuff like "hanging hot dogs from strings keeps monkeys out of your bamboo", but people may actually start doing it. Since I've been posting for a couple weeks it also looks like the daily views increase on average, I guess due to a higher number of posts. I'm averaging around 15-20 now so if you've been posting over a year, I bet you get hundreds of daily views. Alan, I laughed so hard, I cried. This is the funniest thing I've read in a long, long time. I just checked my Google search terms, and they're all fairly normal, unfortunately :-(. I laughed too - you are so funny and clever with some of your post ideas - this one is just great. Oh my ... I laughed so hard! I came to this expecting to read a hum-drum post about Google Searches for your blog - instead you had me in hysterics. Seriously though, "why its not works"? And they up on your blog? I often wonder, too, if people are disappointed that they got to a gardening blog when they googled some strange term that has nothing to do with gardening (I suppose I ramble on). Although, I'm glad I've actually never said "my lawn looks really bad" in a post! The great thing about Google is you can type any crazy thing in and get something back. Yes, but I wish they wouldn't end up at my blog! I follow up the flaky ones, to see where and why they end. I say - I never wrote about ... but I find I DID, after 300 posts I can't remember every word. Oh and what really frustrates me - sometimes I long to be able to answer their questions. If I answer them in tomorrow's post, will they ever come back? Fantastic post, Alan, and hilarious. Some of the things people search for to eventually find themselves at my blog is pretty surprising. And there's one phrase certain people search for that's very not-safe-for-work, and believe it or not they end up at my blog. I can't repeat it here for fear of continuing the cycle! Let's just say that it was NOT used that way in my blog. Loved these. I don't often check my stats but I do love looking at the keyword searches as they're informative (what do people want to know) and often totally hilarious. Hilarious. Keep up the great posts. I too get these doozies. I am guessing a gardening site was not their intent. But the really funny thing is how many times they change up the query and still end up back at GWGT. I have a good laugh over it too. Your post was good for a rousing laugh. One of the most popular searches on my blog is 'Laura Pedlum' -- loosely translates to Loropetalum, of which I have plenty. On my non-gardening blog the most popular search is "How to hem blue jeans." I love this post! Hilarious.. and you narrate it so well. Like your crazy bamboo key words I get crazy hops ones... why multiple people want to 'Grow Hops up Tree' i will never know.. lol. I love that feature on blogger. bwahahaha! Makes you wonder...I'm glad you can see what search terms have brought visitors to your blog. Yours are hilarious.